Summer is going by fast. Already fishing deep water late summer pattern. You won't hear me complain about hot weather living in Mercer . Started out cold again yesterday morning I think it was upper 40's low 5o's again. Porter, Aiden and Logan did well casting 1/8 oz. slow fall jigs and 1/2 crawlers in 12-18'. We fished slopes on the edge of humps and river channels to bring home a fish fry for the group of 12 family members. 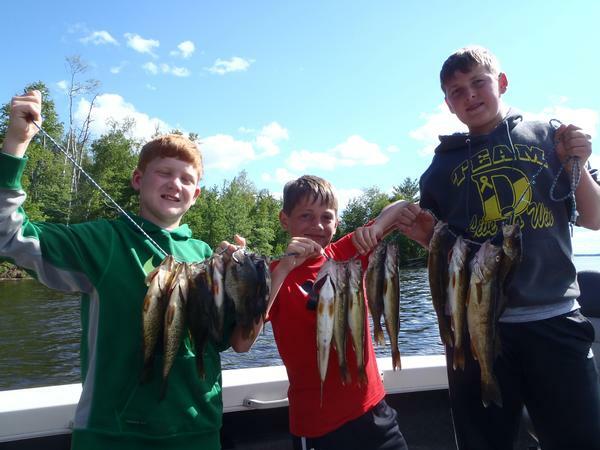 We set out walleye fishing with leeches and crawlers, may have gotten more crappies if we would have had minnows, we fished a few spots where I could see them but didn't get a lot of takers. The kids did well today although it was a challenge teaching the younger kids to follow the bite thru to catch the fish.I Usually bobber fish with kids and we did do some, but the fishing was better on breaks and edges where bobbers aren't very effective. It seems around 13 is an age when there is a little more patience. The kids all caught fish and had fun, they weren't ready to quit at the end of the day that's a good indication to me they were having fun, their dad's however were ready to pull the plug. I've made a lot of friends guiding, this year we had a fish fry at their resort so everyone could enjoy.